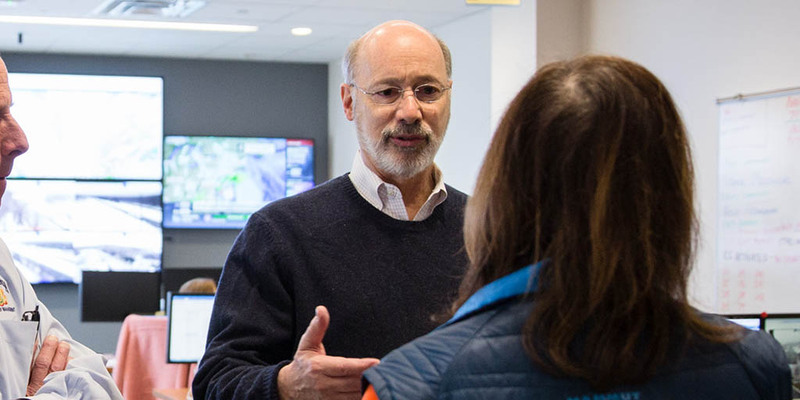 Harrisburg, PA – Governor Tom Wolf today announced his plan to take executive action to continue addressing the opioid crisis and the potential for misuse and abuse of prescription opioids within the Workers’ Compensation system. Learn more about Governor Wolf’s action plan to combat the opioid epidemic and use the administration’s guide to learn how to treat and prevent opioid addiction. Creating Prescription Guidelines for Opioids in Workers’ Compensation: The departments of Health, Drug & Alcohol Programs, and Labor & Industry will work with physicians, nurses, employers, employees, and experts to establish a workgroup of the Safe and Effective Prescribing Task Force to create prescribing guidelines for workers’ compensation. The guidelines will be presented to the appropriate boards under the Department of State for adoption. This builds on the administration’s effort to establish ten sets of prescribing guidelines to combat the opioid crisis. Training for Workers’ Compensation Judges and Providers: Provider education is a critical component to address Pennsylvania’s opioid crisis. Labor & Industry will collaborate with the departments of Health, Human Services, and Department of Drug and Alcohol Programs, as well as Utilization Review Organizations (UROs) to provide additional awareness training to workers’ compensation judges and providers regarding opioids, including information on the recognition and dangers of overprescribing opioids. When providers have the necessary information on the utilization of opioids and alternatives to opioid use, they are better prepared to navigate various treatment options that align with an injured workers’ path to wellness. In addition to providers, workers’ compensation judges serve a key role in the utilization review and appeal processes – understanding the use of and alternatives to opioids can assist judges in ruling on appeals. Call for Legislative Action on Statewide Prescribing Guidelines and Limiting Opioid Prescriptions to Seven Days: The administration supports legislative action on Senate Bill 655, calling for regulatory action for statewide prescribing guidelines, which could be amended to include Pennsylvania’s Workers’ Compensations system, and Senate Bill 472 which would limit opioid prescriptions to no more than seven days except for patients with chronic or unique pain scenarios. Both bills are sponsored by Senator Gene Yaw and would have tangible impacts on opioid prescription reductions and limiting opioid abuse without unnecessarily interfering with the doctor/patient relationship. Senate Bill 472 passed the Senate last year but has stalled in the House since October 2017. Governor Wolf has long said he would sign SB 472. Utilization Reviews to Identify Overprescribing of Opioids: In addition to calling for prescribing guidelines that impact the Pennsylvania Workers’ Compensation system, Labor & Industry will address potential over-prescription of opioids in workers’ compensation by calling for a review on all opioid prescriptions within the State Workers’ Insurance Fund. The department will work to ensure that this does not delay access to treatment for injured workers in Pennsylvania’s Workers’ Compensation system who often face serious injury or illness. Curbing Costly Topical Opioid Compound Prescriptions: The Workers’ compensation system is experiencing an increase in the use of compounded drugs, specifically topical opioid formulas, which are of unknown safety and efficacy. The workers’ compensation system and its payers should not pay staggeringly high costs and have lingering questions about the appropriateness of opioid compounds. Using its regulatory authority, Labor & Industry will propose regulations for opioid and non-opioid compound prescriptions by requiring them to be billed at the ingredient level. Regulating the price of opioid compounds will result in cost savings for Pennsylvania. The department will also review the scientific efficacy of compound prescriptions across the board. Monitoring Opioid Prescriptions in Workers’ Compensation with PDMP: A result of the interagency coordination of the disaster declaration, the workers’ compensations system now has access to the Pennsylvania Department of Health Prescription Drug Monitoring Program database. This change provides the department the ability to see all workers’ compensation coded opioid prescriptions furnished by providers and filled by pharmacies. Identifying Over-Prescribing: The Department of Labor & Industry is pursuing efforts to identify medical fee review applications that may indicate overprescribing of opioids and to report those providers to the Department of State for investigation. The fee review process is a remedy for health care providers who dispute the timeliness or amount of payment received for medical services provided to injured workers. Promoting Certified Safety Committees: Existing Workers’ Compensation law provides a 5 percent premium discount for employers that participate in the PA Certified Workplace Safety Committee Program and certify compliance with the department. Each Committee member must receive annual training in four mandated topics, including substance abuse awareness. From January 2015 through December 2017, more than 77,000 individuals have been trained, including 2,650 individuals across 55 sessions, regarding substance abuse topics, including opioid addiction.